So that was left on my voicemail a few weeks back. I’ve been sitting on it, sort of seething. The person left me no name, no number, just a voicemail drive-by. I would have actually liked to talk to him, heard his experiences, learned from him. But instead, I came into the office to a message of hate. A well-intentioned message, but one of negativity nonetheless. On the positive side, here’s another #detroithouse story that’s been making the rounds. 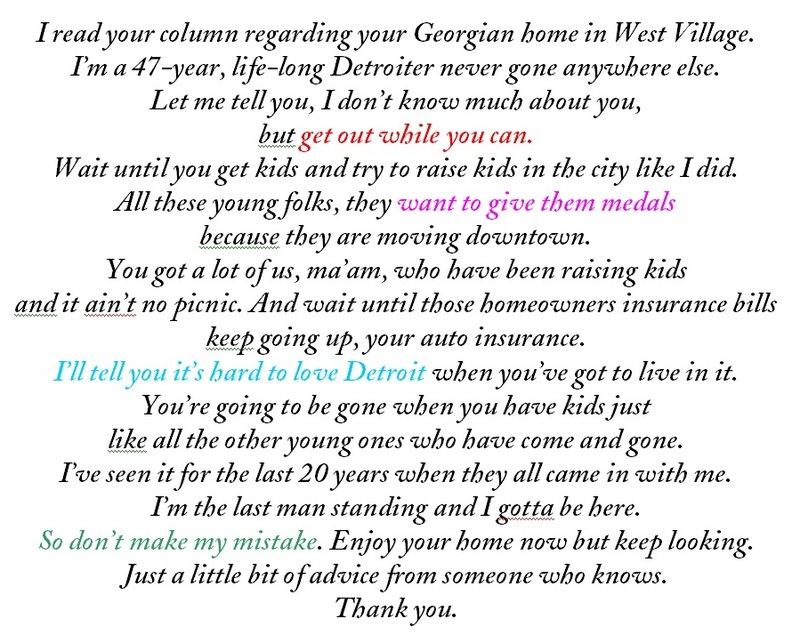 A fellow Detroiter tells his story of buying a $500 fixer-upper and renovating it himself. Our experiences couldn’t be more different, but yet I think the spirit is the same. Karl and I had the luxury of staying in a temporary apartment with heat and water and power until we could move in at the first of the year. We also have amazing contractors on our side, who are just killing it when it comes to the craftsmanship. Meanwhile, this guy spent two Michigan winters living in a house without heat. Having just lived through a few days of below-zero temperatures here, I can definitely say that’s not a life experience I ever hope to have. But I admire him and what he’s doing. Guest Post: I Slept in Matilda! You’ve arrived at a beginning. Your experience starts at the end of his. No comparison. That man sounds defeated while you sound very positive. Ignore his bark. That’s all he has. You have so much more. Great house! I get that it’s strange to receive a message like that, but to me that doesn’t read like a ‘message of hate’ at all. It sounds like more like a warning about thinking critically about the spectrum of life experiences in the city. I think it’s worth considering how much more amplified the voice of ‘young, urban, creatives’ or whoever are in comparison to the voices of long-established residents who have had to deal so much more than the typical U.S. city dweller. Why is this person’s perspective any less valid than yours? I’m not saying it’s less valid, Will. I said in the post that I wanted to interact with him or her to understand the perspective. And if it were his/her own blog post talking about those issues, that would have been excellent; an anonymous rant on my voicemail certainly isn’t a way for that dialogue to penetrate into the wider world. But because it was on my voicemail and I heard tone, I get to assess the intent and talk about how it made me feel. Not leaving a name let alone a number tells me that this isn’t a person who is interested in a thoughtful conversation about the disparity in coverage between those who are coming and those who have stayed. It told me that this was someone who is angry, hurt and frustrated, which I understand, and who made a number of assumptions about me that were false. Maybe to your mind that’s all fair game to dump on someone’s voicemail or in an unsigned email. But I gotta say, it’s a helluva thing to start your day to.